In front of Our Lady's church stands the large complex of the medieval St. John's hospital, one of the oldest still existing hospitals in Europe. In 1978 it lost its function as hospital and harbors now the Memling museum, the hospital museum and the old pharmacy. It was transformed into a museum and a congress center. 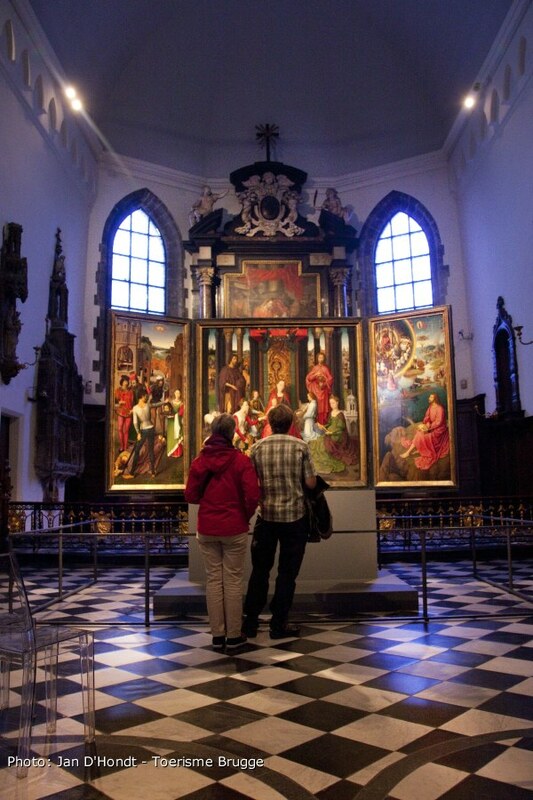 Inside the old chapel is now one of the smallest but most attractive museum of Bruges, the Memling Museum. Here six paintings by the 15th century painter Hans Memling can be seen. Hans Memling (1433-1494) was one of the later ones in the row of "Vlaamse Primitieven" (Flemish Primitives). The wealth of Bruges also attracted artists and made Bruges the most praised city of the art of painting in the thirteenth century. Even though none of the big names like Van Eyck, Memlinc, Gerard David were born in Bruges, a innovative style was born here, that still has a world fame. Memling lived for a long time in the St. Johns hospital and died there. While most top art museums in the world have one or two paintings by Hans Memling, St.John's has six important works. This museum is part of the St.John's Hospital complex. Inside, the old hospital infirmary can be visited as well as the old pharmacy. In the former chapel of the Hospital six paintings by Hans Memling are exposed. One of the masterpieces is the Shrine of St. Ursula. This wooden shrine contains the relics of St. Ursula. In six bow-arched panels, Memling tells the history of Ursula. The two front panels show St.Ursula accompanied by 10 virgins, each representing 1.000 virgins (see picture below) , and Our Blessed Lady in the presence of two hospital sisters. The St Ursula Shrine was the first Memling work to be identified as such in a historical text. Although commissioned for St John's Hospital, it has neither an inscription nor a signature, unlike the St John altarpiece and the Floreins triptych, both of which were ordered for the same institution. This might be explained by the fact that the shrine was not on permanent display, but was shown only on the feast-day of St Ursula. Unlike the paintings, which also focus attention on the donors and the maker, this is a purely liturgical object. Memling's care for detail and constant concern for harmony are part of his predilection for a classical style. These aspects of his art are given their finest expression in the St Ursula Shrine. Memling was commissioned to decorate a new reliquary, to which the saint's remains were to be transferred on 21 October 1489 during a grand ceremony in the chancel of the church of the hospital of St John. (The relics would seem to have previously been kept in a small 14th century chest, which has also survived). An 800 year old medieval hospital with beautiful art work and artifacts. The new shrine was made of wood, based on a model in precious metal. It is in the form of a house or chapel, the pack-saddle roof of which is set with painted trompe-l'oeil "tondi". The decoration of pinnacles, gables, crockets, finials, interlacing and statuettes in niches, is in the finest flamboyant Gothic style. The six arched openings in the sides take the place of stained glass windows, and recount six episodes from the life of the saint as recorded by Jacques de Voragine in The Golden Legend Ursula was a Breton princess. She agreed to marry Eree, son of the pagan King of England, on the condition that he convert to Christianity. She was subsequently martyred for her faith at the hands of the Huns. The other masterpiece is the 'Altarpiece of Saint-John the Baptist and Saint-John the Evangelist', made in 1479 and painted for the main altar in the church of the hospital. In the central panel is the Holy Virgin holding the child Jesus. Jesus puts a ring around the finger of Saint Catherine of Sienna. The woman sitting on the right of the Holy Virgin is Saint Catherine of Alexandria. The left side panel shows the story of Saint John the Baptist who was decapitated by order of Salome. The right side-panel illustrates the Apocalypse as told by Saint-John the Evangelist. 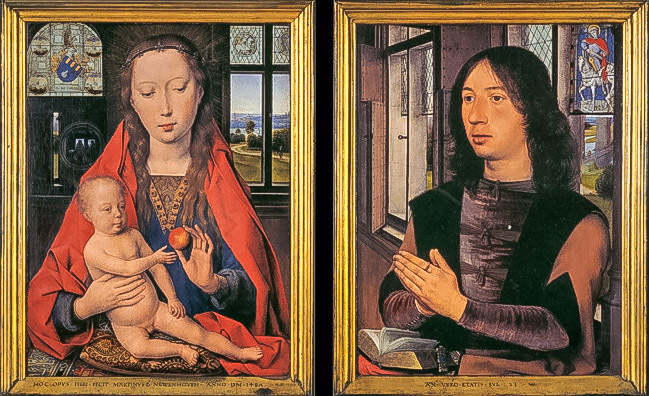 The 'Diptych with Our Blessed Lady and Maarten van Nieuwenhoven' (1487). Maarten van Nieuwenhoven was a member of a rich and important Bruges family. He is shown here at the age of 23. Later he became Lord Mayor of Bruges.